Funding for drone makers has bottomed out although new applications using drones are still getting funded, e.g., home and business security drones. Consumer purchases are weak with DJI and Parrot’s line of products capturing most of the market, and DJI’s aggressive lowering of prices forcing startups and other makers to focus on specialized tasks. There’s turmoil in the drone industry. GoPro Inc recalled about 2,500 drones – all of their shipments thus far – for a refund – after just a couple of weeks on the market. Units had sudden power outages. GoPro didn’t say when or if it would offer a replacement product. GoPro’s much-delayed Karma project is also threatened by competing and lower-priced camera drones from DJI and many others. Part of DJI’s strategy exhibited over the past few years is to offer newer and better products faster than the competition and reduce prices of previous versions in conjunction with the new launches. Their price slashing has enabled them to dominate the market. DJI discounted its popular Phantom 3 drone to about $300 today from $1,000 at the beginning of the year. “It’s no fun watching prices fall by 70 percent in 9 months” [referring to DJI’s price-cutting]. 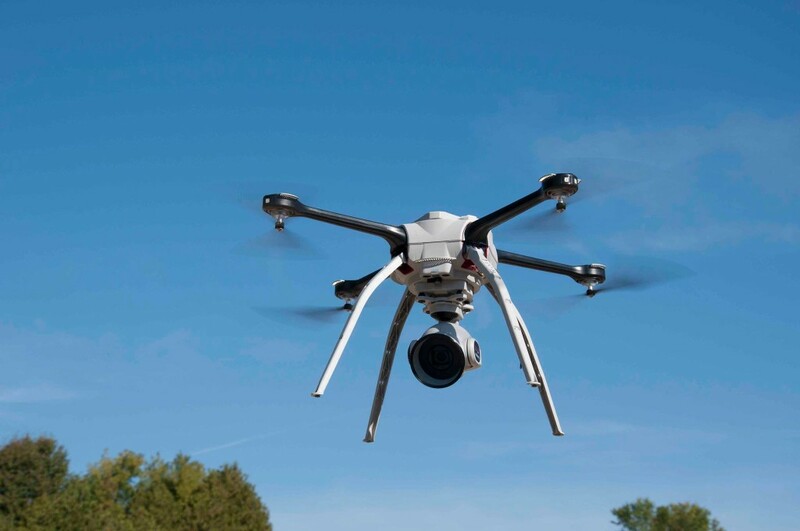 In a retrenching effort, 3DR unveiled a new commercial camera-equipped drone (the Solo) with imaging software designed for construction companies. 3DR’s plan is to outfit the Solo with new technology to capture 3D images that show the shape, size and volume of items at a construction site. “Alphabet, Google’s parent, has been developing delivery drones in its research arm since 2012 with the hopes of transforming logistics. But the drone project—dubbed Project Wing—has had a bumpy ride, with its original head departing in 2014. Alphabet last month pushed out the project’s chief, Dave Vos, and its top commercial executive, Sean Mullaney, in large part because of conflict between the group’s engineers and its commercial team, according to the people familiar with the matter. It also issued notices to several other Project Wing workers, giving them 90 days to find other positions within Alphabet, one former employee said. An Alphabet spokeswoman said the company is committed to Wing and the concept of delivery drones. Astro Teller, the new temporary head of Project Wing, has spoken recently about the potential for delivery drones to not only upend logistics, but also, reinvent the concept of ownership by giving people access to some goods in minutes versus having to keep such items on hand for the rare moments they are needed. Lofty goals indeed for Google and Teller. But turning the corner from research, testing, and product engineering to a functioning product that conforms to FAA and other governmental regulations and is secure from pranksters, children and thieves is another matter altogether and there’s a ticking clock of competitors hoping to get to market first. Many, many companies, including Amazon, DHL, Walmart and UPS are aggressively developing drones and landing/delivery systems for same-day and/or speedy delivery. While many drone-makers overestimated demand from hobbyists and other consumers, they now see big opportunities selling to businesses. There is strong interest in software and services that can make aerial imaging useful for industries including insurance, construction, agriculture, and entertainment. senseFly, a Parrot company and DelAir, the new owner of Gatewing (a drone and service provider to Trimble’s global agricultural division, join startups and others (see chart below) that are focusing on software to make sense of images, whether it’s the angle of a pipe laid at a new construction site or damage to a roof from a hurricane or collision-avoidance. The drone itself is just a tool in the overall objective. Parrot, whose stock has plummeted from $25 to $8 so far this year, predicted that 2016 would be a “bloody year” for drone makers. Parrot CEO Henri Seydoux, in an interview in Forbes in November, 2015, predicted 2016 would be a year of reckoning for the consumer drone space and that 2016 would be a ‘bloody’ 12 months for any company designing and selling unmanned aerial vehicles (UAVs) for hobbyists. It’s just the nature of the consumer electronics business, he said, noting that increased competition will see a commoditization of the flying robots and perhaps even the collapse of some of the weaker companies. Delivery drones will happen someday soon; drones in agriculture and construction are already happening; drones for governmental and defense/security purposes will continue to happen. 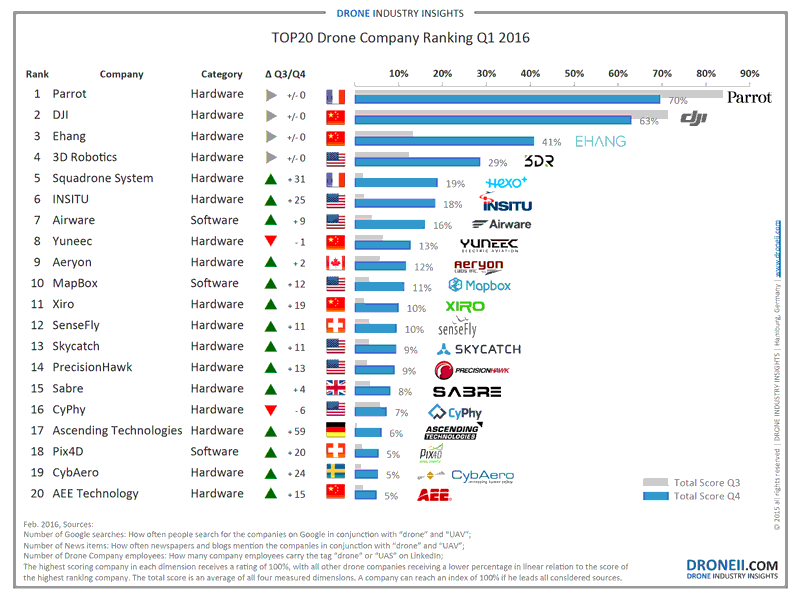 What we are seeing today is a consolidation process: commercial makers are separating into consumer or business providers; although the Drone Industry Insights chart shown below is already outdated, the big makers, Parrot, DJI and Ehang are hanging in there with substantial sales. Not shown on the chart are all the defense contractors that produce drones for the military; these vendors have pretty much given up on finding niche commercial markets and are, instead, focusing on improving their products and systems. Certainly 2016 is living up to Seydoux’s predictions. Even the recent spinoff by Trimble of its Gatewing division is indicative of the consolidation and refocusing of efforts toward providing meaningful services using drones rather than selling drones. They’ll leave that – selling drones to hobbyists and consumers – to the few companies that are able to emerge from the dropping prices of the commoditization of this type of camera drone.